Some movies age better than others, and 1957�s Desk Set shows all the hallmarks of a film that should date badly. However, in spite of those potential issues, it manages to offer a surprisingly light and enjoyable romantic comedy. We meet absent-minded Richard Sumner (Spencer Tracy) as he goes to confer with Federal Broadcasting Company president Mr. Azae (Nicholas Joy). Due to his scatter-brained nature, Sumner shows up a day early, so he goes to check out the network�s research department; we figure out that his freelance job will connect to that group, but the reason for this remains hush-hush. 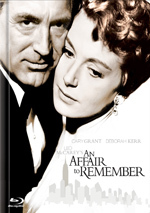 A kind of efficiency expert, Sumner goes to chat with research department chief Bunny Watson (Katharine Hepburn); he remains evasive about his work although he�ll need to spend a lot of time in her office. We also meet Mike Cutler (Gig Young), Bunny�s workaholic supervisor and tardy paramour who seems to take her romantic interest for granted. He invites her for a weekend away but inevitably needs to cancel due to work. On the surface, Desk Set probably should stink. After all, it presents a minimal story, as it includes little to move along the tale. The movie focuses on a small part of the world with a limited roster of characters and moves at a slow pace. All of this feels like a recipe for boredom. However, Set works surprisingly well, though it can be hard to pin down the reasons for its success. Obviously Hepburn and Tracy earned a well-deserved reputation for their talents, and they work together well here. Despite the differences between the characters� personalities, they mesh nicely enough to seem real and like a believable couple. No real sparks fly, but they�re not necessary in such a quiet little flick. 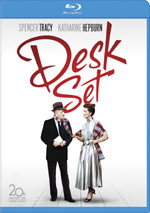 Desk Set appears in an aspect ratio of approximately 2.35:1 on this Blu-ray Disc. Though not stellar, the image was more than satisfying. For the most part, sharpness looked fine, though softness materialized at times. Some of this connected to photographic techniques like split screens, but other soft shots lacked obvious explanations. Nonetheless, the movie usually displayed positive delineation. No issues related to jagged edges or moir� effects popped up, and edge haloes remained absent. With natural grain, I didn�t suspect any strong noise reduction, and the image lacked specks, marks or other print flaws. Black levels also appeared deep and rich, while shadows were nicely detailed and concise. My main potential misgivings about Set related to colors, as it featured a palette that tended toward a teal tint. Initially I thought this would restrict itself to the research office, but the blue feel popped up in other settings as well. When I reviewed original DVD, I noted that I felt the movie delivered a fairly natural palette, so the dominant nature of the teal surprised me. Because it�s been nearly 10 years since I watched the old DVD, I figured it�d be best to give it another look so I rented it. In terms of colors, I felt the DVD showed a little of the Blu-ray�s tint but not nearly as much; when I went from the DVD to the Blu-ray, the emphasis on teal in the latter became striking. So is this a case of studio tampering with the Blu-ray or does the new disc better reflect the original visual design? Excellent question � and one I can�t answer. Just because the colors differed doesn�t make the Blu-ray wrong, so it may more accurately reflect the source photography. Even though Hollywood seems obsessed with teal in modern movies, it doesn�t make sense that Fox would change the colors for a 56-year-old comedy like this. After all, this isn�t a case like The Terminator, another movie that looked a whole lot more teal in its recent release than in prior incarnations. While most of those involved with Terminator are still around and may have involvement in home video versions, most of those concerned with Desk Set would be long dead. Anyway, I�ll remain neutral on the question of color accuracy. To be sure, the teal doesn�t truly overwhelm, so don�t expect Desk Set to look like a Transformers movie. Nonetheless, the hues veered blue more than I would expect and more than they did on the DVD, so I wanted to cite the issue. The DTS-HD monaural soundtrack of Desk Set seemed fine for its vintage and ambitions. Speech could be a bit metallic, but the lines were always intelligible and lacked obvious flaws like brittleness. Music seemed reasonably full and accurate, while effects showed decent clarity and accuracy. A movie set in an office didn�t open itself up for sonic fireworks, so don�t expect much, but the audio fit the story. How did the Blu-ray compare to the original DVD? The Blu-ray omitted the DVD�s remixed stereo soundtrack, which was fine with me, as it wasn�t impressive. The Blu-ray�s mono mix was a little fuller and more natural than the single-channel track on the DVD, though there wasn�t a lot to be done with 56-year-old material. As for the visuals, I already weighed in on color issues. Everything else obviously improved on the Blu-ray, as it was tighter, better defined, cleaner and more film-like than the DVD. Except for a still gallery, the Blu-ray duplicates the DVD�s extras, and we start with an audio commentary from film historian John Lee and actor Dina Merrill. Both recorded separate running, screen-specific tracks that later got edited together. Not surprisingly, Lee�s comments focus on the facts and history while Merrill goes for a more experiential feeling. Actually, my indication that she offers a screen-specific track isn�t totally accurate; at times she does this, but usually she discusses aspects of her career unrelated to Set. Early on, she tells us anecdotes about her experiences on the set and with the other actors, and that gives us a nice look at life with Hollywood legends. After that she mainly talks about her work on other films, and she does so in a fairly blunt manner, such as when she relates her opinion of John Frankenheimer in no uncertain terms. Lee tends to come across as academic and seems to be reading his remarks. He lets us know the backgrounds of the performers as well as their work in the movies and various aspects of the shoot and the processes. We get some brief history of Cinemascope and a look at a few movie-making techniques. Unlike others such as Rudy Behlmer, though, he doesn�t talk much and fails to relate a lot of useful information. Merrill�s stories are often good, but it gets frustrating that she has so little to say about the movie at hand. Add to that many gaps in the commentary and it ends up as a decent but erratic piece. In addition to the film�s trailer, we find a Movietone News short. �Designers Inspired for New Creations By Film Desk Set� runs 59 seconds as it shows images from a fashion show. It�s not very interesting. An unassuming but entertaining romantic comedy, Desk Set never aspires to much, but it succeeds nonetheless. The movie gains from the charm of its cast and also benefits from a lack of pretension. 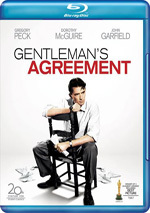 The Blu-ray delivers generally good picture and audio along with an average audio commentary. The disc could use more supplements, but it offers the best presentation of the film to date.